"You wouldn't drive your race car before fueling it up, and your body is no different," explains Sean Garner, a trainer at Anatomy at 1220, which makes perfect sense from a fitness perspective. Working out on an empty stomach may sound like the best-case scenario (imagine having a steak dinner than sprinting on a treadmill), but the key is to carefully cherry-pick the meals, or rather, snacks you eat to help prepare your body for the (good) stress you're about to put on it. As you probably could have predicted, protein-rich foods are your best bet before hitting the gym, especially EAAs (essential amino acids, like quinoa) as well as whey protein, which promote lean body mass and strength. Studies show that protein performance peaks within the body about 45 to 90 minutes after consumption, so timing is also key in getting the most from your pre-workout snacks. Want some yummy ideas other than quinoa, though? (We don't blame you.) Take a look at some expert-approved noshes below. "This is a classic go-to for pre-workout food," says Garner. "This is what I eat when I travel because you can find both items everywhere. 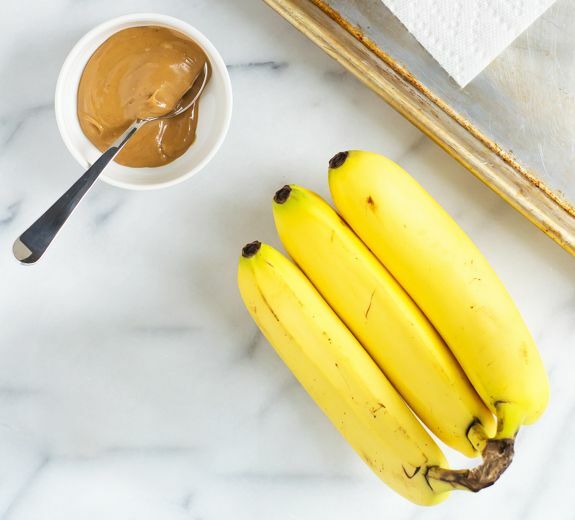 One banana and one tablespoon of peanut butter will help give you energy and keep you full during an intense training session." "These are not your typical doughnuts. My favorite and [the] best tasting are the Know Foods Donuts ($10)—they are grain-free, gluten-free, non-GMO, no trans fat, high-protein, low-carb, and taste amazing. Each Donut [has] about 20 grams of carbs and 12 grams of protein." "Branch chain amino acids help the body to recover and rebuild muscle. They can be taken before, during, and even after you work out. They mix easily with water, and they are my go-to when I train early in the morning," says Garner. This snack is a favorite of Thumbtack personal trainer Kaitlyn Noble, who says, "Carbohydrates are broken down into glucose once digested, which is our body's preferred energy source. Including some protein is crucial, particularly if your workout includes strength training." This potato-and-egg combo is a perfect mix of both. "If you do drink caffeine, a small amount (like eight ounces of coffee or green tea) 30 minutes before your workout has been shown to improve performance," says Noble. She recommends blending one frozen banana and one frozen zucchini with one cup of coconut milk, one to two shots of espresso, and collagen protein powder. You can also add a teaspoon of coconut palm sugar if you want to sweeten it. Instead of purchasing a sugar-filled trail mix from the grocery store, Noble recommends making your own blend of raw nuts and unsweetened dried fruit. Nuts contain carbs, protein, and good fats to fuel your workout, while the fruit provides vitamins, minerals, and carbs. Greek yogurt is packed full of protein (around 17 grams), which makes it a great energy-booster. Noble recommends topping it with berries (a great source of antioxidants) and fresh granola (no processed sugar). Next up: the one thing you should never eat after a workout.